After work on June 5th I headed over to the roof of the Sherman Plaza Self-Park to see if I could get a shot of the once (or twice) in a lifetime Venus Transit solar event. The closest I could get was the 200mm end of my Nikkor 70-200mm VRII, so I tried with that and a 1.2 ND filter but even with the fastest shutter speed (1/8000) and minimum aperture (f22) the sun was still way too bright to resolve properly in the exposed image. I fumbled around with settings for a while until I realized that both sides of the ND filter were threaded, and I had three other filters in my bag. After stacking the 1.2, 0.9, 0.6, and circular polarizing filters (4 total) and tweaking some other settings, I was finally able to get a well exposed image and some excellent color! 200mm is definitely not close enough for real detail of the sun, but the 36mp sensor on the D800 allowed me a serious crop and the result is about as good as I could have asked for with the equipment on hand. 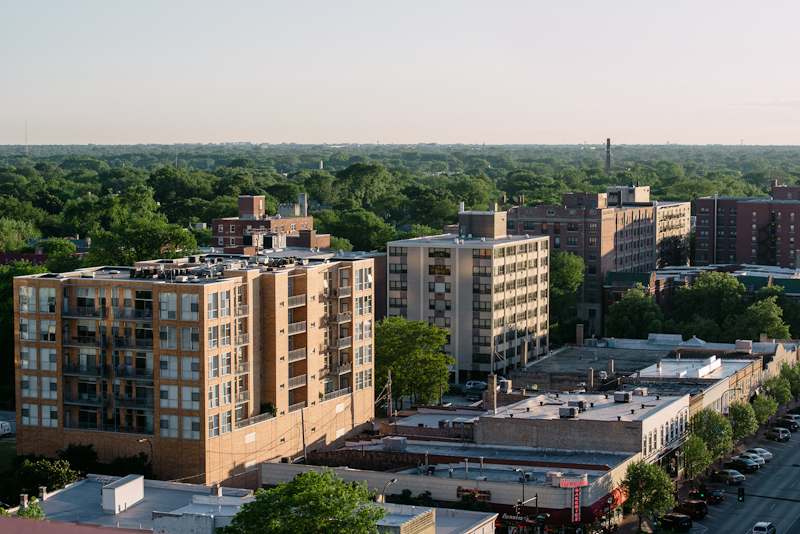 I also grabbed a few additional photos of Evanston during sunset since I already had a great vantage point. First photo is looking south at downtown Chicago along the Metra and El tracks. Second photo is looking southwest across Davis Street.